In the occasion of MAREANOs 10th anniversary, a new book presenting the results of the mapping and surveys of the Norwegian sea floor has been released. The book, which is in English, is an expanded and updated version of the Norwegian book from 2010. - This is a book that is enjoyable by anyone with an interest in oceans and seas. The wonderful illustrations make it difficult to put the book down, no matter what background you have, says Hanne Hodnesdal (Norwegian Mapping Authority) whom together with Lene Buhl-Mortensen (the Norwegian Marine Research Institute) and Terje Thorsnes (Geological Survey of Norway) are the editors of the new book. The book, titled ”The Norwegian Sea Floor”, describes the seabed from the Russian border in the north to Storegga and Møre in the south. Along with unique pictures, a diversity of habitats of different marine landscapes are presented. In addition, depths, sediment composition, benthic communities and the presence of hazardous chemicals are presented systematically for the various areas that have been mapped through MAREANO so far. - This is a colorful book packed with knowledge. We hope it will make us all proud of the wonderful sea and the hidden landscape that lies beyond our shores and is an important part of Norway, says Lene Buhl-Mortensen. - "The Norwegian Sea Floor" brilliantly exemplifies a collaboration where the whole is greater than the sum of its parts. We have pooled knowledge and expertise of various contributors with very different professional backgrounds - and the result is new knowledge and enhanced science for use in the Norwegian marine management and by other interested parties, the editors say. In recent years, MAREANO has studied, inter alia, depth, biology, geology and chemistry in the southern part of the new Norwegian waters of the Barents Sea. Here, the relationships between geology, biology and marine environment on and above the sea floor is evident. New knowledge and increased accuracy in modeling of habitats has been developed in the past three years by including temperature, salinity and current patterns in the ocean. In the areas of the Barents Sea that are now mapped, the bottom is largely soft, consisting of unconsolidated sediments. These mudflats may seem monotonous and barren, but in reality they teem with wildlife down in the sediments. As soon as harder ground or coarse-grained ridges appear, where animals can get sufficient hold, oases arises, with anemones and other wonderful species that thrive on hard surfaces like rocks and mountains. In addition, marine "snow" and thick layers of organic deposition material from the bottom of the Barents Sea, has been recorded on video for the first time. In the Norwegian Sea, the MAREANO project has obtained new knowledge about the composition and origin of habitats along the edge of Møre to Lofoten. Here, MAREANO has focused on the dramatic geological events, with correlating biological effects, of a large underwater landslide at depths outside of Møre 5,000 years ago. Along “eggakanten”, the trailing edge of the slide, at 500-800 meters depth, the project has registered significant changes in species diversity in the transition from plus to minus degrees, which is important information for both marine management and scientists. 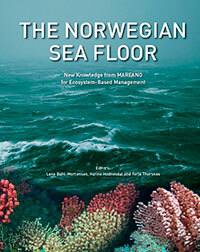 "The Norwegian Sea Floor" is an updated version of the book "To the bottom of the Barents Sea and the marine areas off Lofoten» from 2010. The new version is published in English due to the international demand for MAREANO results. - The EU and many other nations are focusing strongly on preparing good atlases of the seabed. MAREANO means that Norway has already come a long way towards attaining this goal, much further than most other countries, and a great deal of international interest is therefore surrounding this project, says Terje Thorsnes.